Close your eyes and imagine hyper-technological and massive huge cities that expand all over the globe’s surface. Imagine a far away, remote future where technology has made great strides and in which humans are perfectly integrated. A perfect, radiant future where humanity has reached a new evolution. A little black box containing something alien and unknown. Close your eyes, can you feel your heartbeat? Every single atom of the world you know is synchronized to the pulsation of your heart. The box has been opened, reality has been remolded according to old inexplicable commands. Open your eyes, the abandoned, destroyed huge cities are still there. Humans live in fear and despair, hidden in the darkest ruins. Droids are only old scraps, Artificial Intelligences are only old baluards of the times that have been. A dark, infinite, ravenous shadow is all over this. Evolution Pulse is a Fate Core/Fate Accelerated setting. In this book, you will find all that you need to play your adventures in this dark future full of unique characters, who are able to manipulate reality. 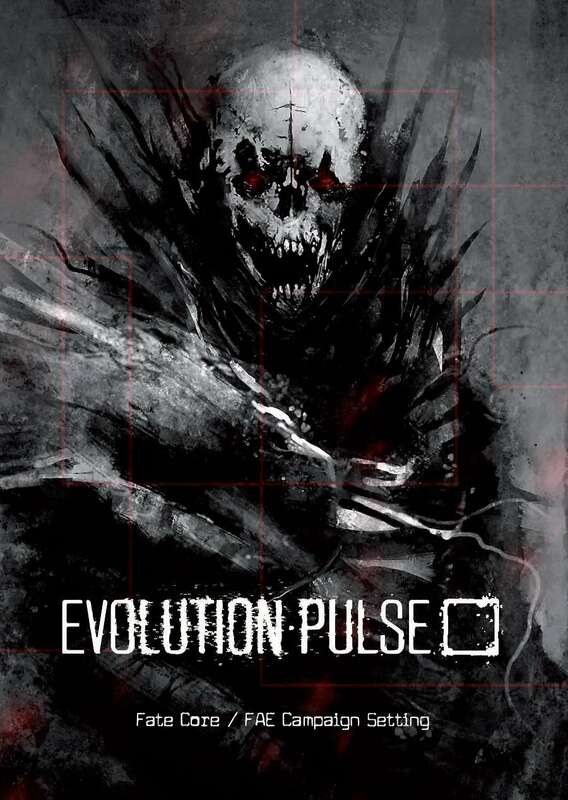 You will find all indications and suggestions you need to bring into your game all the features of the world of Evolution Pulse: from Executors, characters related to Artificial Intelligences, to fearsome and lethal Hekaths, inter-dimensional monsters who have devoured and destroyed the world. Four peculiar archetypes from which to choose your character, plus one extra special archetype, all of which bring powerful themes into play. Close your eyes, synchronize the heartbeat, the evolution pulse. Do you guys have any plans to publish the expansion Dark Echoes in english this year or in 2018? And the freebies about Evolution Pulse, do you have any news? I was also curious: was Evolution Pulse influenced by BLAME! or NOiSE or BIOMEGA? For the materials I’m going to ask to the authors. Good Ming, Daniele! I was curious if you had heard back from the authors about gettin Got English versions of the downloadable extras on the Italian website? I'm from Dreamlord Press, the publisher actually, not one of the authors, but I think I'd leave a reply here. We're actually working on some different projects, to translate them into english and let some more people to partake od them. One of them is offering you all the freebies about Evolution Pulse, and also to bring you the full supplement "Echi Oscuri" (Dark Echoes) with more archetypes, lore and hacks to implement in your games. Don't know yet a date for them to hit the international market, as daily life always gets in the middle, but we're coming. I can't offer any help for translating, but if you need help EDITING the translated products feel free to contact me! I was curious if any headway had been made on the translations of the extras and the explansion, Dark Echoes? Even just a timeline update. We are on the verge of finiscing the translation of Ars Gladiatoria, before getting on Evolution Pulse (extras first). So I think we'll be back in track soon. Nicola, could you give us an update on the progress with the Evolution Pulse stuff? Thanks! I was wondering if you could provide an update on the translations of further materials for Evolution Pulse into English. I hope everything’s going well! Mi domandavo se fosse necessario possedere il manuale Fate per usufruire de questo prodotto. E, come già chiesto più sotto, se fosse prevista la traduzione inglese del vostro supplemento (vivo in Canada e i miei compagni di gioco non leggono l'italiano). Per la seconda domanda, intendi se è prevista la traduzione in inglese di “Echi Oscuri”? Grazie della risposta. Quanto alla seconda domanda, sì è proprio quello che intendevo: Echi Oscuri sarà tradotto? Oddio, se conosco bene i ragazzi, direi che prima o poi arriverà, ma prendi le mie parole con le pinze, che magari hanno altri progetti da fare prima (quasi sicuramente). Do you guys have any plans to translate the expansion Echoes Dark? I hope so as I am eager to see more of the game world. We're working hard on having the product properly done for PoD, like more proofreading and editing. We've been also busy with a couple of big fairs and cons here in Italy, but the work is still progressing fast. Thank you for the reply. Congratulations on being so busy (this must be a good thing)! I'll be sure to keep checking back here regularly. Any update on an English PoD version of this? Are there any plans to release a print version of this book?